Want A Bigger iPhone? There’s A Pad For That! One of the biggest problems with the iPhone/iPod Touch is that it’s, portable, and easily fits in your pocket. Err.. Who said that was a problem again? Apparently Apple started hiring designers from Texas where “Everything is Big” because their new iPad device isn’t so portable. The name of the new device might sound clever, but MrGroove reported the real source of the name over on groovyHacks.com after a tip-off from groovy user shockersh. So what’s the scoop on this iPad anyway? Scheduled to be released 60 days from now, the iPad is the latest in Apple’s line-up of multitouch-screen devices. It follows the same operating system that the iPhone uses. Users will be able to use most of their already purchased apps on the iPad as well. The iPad stands 9.6 inches tall, 7.5 inches wide, and weighs 1.5 pounds. Other than the size, if you know what an iPhone is, there isn’t much else that’s different, except it doesn’t have native support for phone calls, a mic, or a camera. So it’s just a big iPod Touch? Essentially, yup. It has Wi-Fi, it has the same 16GB, 32GB, or 64GB flash drive, it plays a max of 480p TV out. It has Bluetooth 2.1, and audio frequency response from 20hz to 20,000hz. It ships with native HTML5 support, but still doesn’t support flash; most likely because Safari + Flash = Bad Joo Joo. Lastly, good news if you have an expensive iPhone/iPod headset as the jack is still 3.5mm! Similar to the iPod Touch, the breaking temperature range is still –4 or +113 degrees Fahrenheit, and the maximum non-pressurized altitude is 10,000 feet, so don’t take it sky-diving or into a sauna! But there are a few differences we’ll look at below. 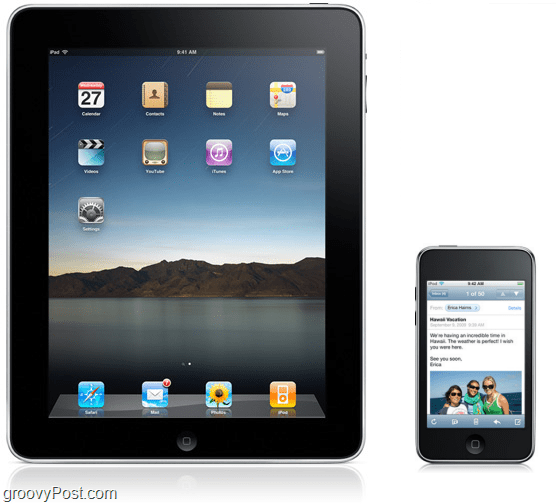 What’s different between iPod Touch and the iPad? The most noticeable thing is the size, it’s roughly seven times bigger, so its maximum screen resolution will be 1024×768 instead of the Touch’s 640×480. The next noticeable thing is that it costs twice as much, ~ $499.99 or higher depending on how much space you want. On a more technical level, the iPad supports Wireless 802.11 N, whereas the Touch only supports b and g from Wi-Fi networks. Included is a sim card tray for connecting to 3G networks. AT&T will be offering an unlimited data plan for $29.99/ month. Luckily there is no long-term contract involved. The processor in the iPad is faster than in the Touch, but due to the increased size of things it balances out performance-wise and responds at relatively the same speeds. The most interesting thing to note is the battery life. The iPad boasts a 10 hour battery life regardless if it’s watching videos, running apps, or playing music. The iPod Touch has a 30 hour battery life for playing music, but will only last 6 hours playing videos. So the iPad has the iTouch beat with playing videos and apps, but shouldn’t be used as a primary music player. It’s not a laptop, and it’s not an iPhone. But it does have a pretty sweet 9.7” (diagonal) screen. And if you don’t mind it not fitting in your pocket (unless you have really big pants!) it can be your next iPod Touch upgrade that is sure to get scratched and banged up 7 times easier. I don’t really see a reason to pay $500 for this, but it might just be a good way to get your grandpa to check his email on something he can actually see. Want to check it out some more? Visit the official Apple iPad website. Have any iPad thoughts or comments? Would love to hear them below or in the on-going groovyPost community iPad discussion. Gotta love that huge screen! The Texas comment made me laugh lol. Ya know…. Personally I think this is a photo album killer. Grand parents or friends come over and sit on the couch, grab an iPad and look at thousands of photos. That’s what I’m looking forward to. Great use case. Personally I stream all my images to my xbox 360 from my windows 7 media center however…. that requires me to be in the room to set it up and if ppl are already watching TV….. So yeah, iPad = Paper Back Photo Album killer… I agree. It may be a great “Paper Back Photo Album killer” … for some. At $500 it’s going to be a while before everyone decides to kill the paper photo album. Some people want to hold on to the old ways. Very true. There will always be those who want paper and based on a $0.13 print cost for a 4×6 photo, it will take over 3000 photos to justify an ROI (not counting albums of course). 5. a data provider other than AT&T, perhaps in the future still? Screen Protector – Well… if the durability of the screen is anything like my iPhone, I probably won’t put anything on it. On my iPhone the main thing that shows wear is the back side and being that the iPad has an aluminum body, that issue should be mitigated. Dude, it’s a BIG iPod Touch. That’s the design. Why change what already works?